Following on the heels of the Hollis v Holder lawsuit filed in late October, Mississippi attorney Stephen Stamboulieh – along with additional counsel David Scott – have brought a second suit alleging that, through 18 U.S.C. §922(o), 26 U.S.C. § 5801 et seq. and the implementing regulations 27 C.F.R. § 479.105(a), the US government has overstepped their powers as provided for under Article I of the US Constitution and violate the Ninth and Tenth amendments by creating a de facto machine gun ban. Additionally, the suit claims, the regulations violate the plaintiff’s (and others’) Second Amendment rights. This is part of the case made in the Watson v. Holder complaint filed last week. A twist on this case compared to the previously filed Hollis v Holder complaint is that the defendant, Ryan Watson, as a trustee of the Watson Family Gun Trust, had already made the 10.5″ barreled Palmetto State Armory (serial number LW001804) into a machine gun as per the Form 1 as approved by ATF official, Shannon Siviero. It was sometime after this that the ATF “changed their minds,” whited out the relevant portions of the approved From 1, and demanded that Watson “abandon or otherwise surrender” the machine gun and stamp. Following subsequent communications between Watson and the ATF (including a promise of no further criminal prosecution), Watson surrendered, under protest, the new machine gun to the ATF – although maintaining his ownership interest. 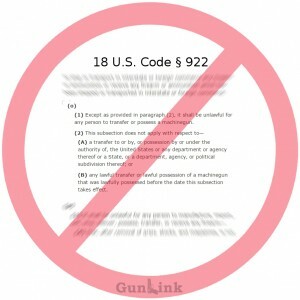 In both cases, declaratory and injunctive relief is sought in the form of either declaring the laws and regulations noted above to be unconstitutional or, alternatively, to find that unincorporated trusts are not prohibited by 922(o) from manufacturing or possessing post-May 19, 1986 machine guns as individuals would be under the Hughes Amendment to the Firearms Owner Protection Act.